The SERENE HOUSE Organic Air Spray is based on the same fragrance notes and recipes as our essential oil blends. 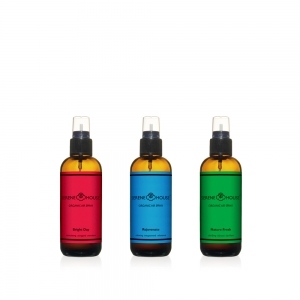 The spray contains essential oils blended with water and a bioalcohol, which is extracted from wheat. Bioalcohol accelerates the speed with which water and essential oils blend and is absolutely harmless to breathe in when evaporated. Compared with normal alcohol, organic alcohol is completely expelled without causing any residues in the human body. SERENE HOUSE is proud to make three different 100% organic blends available to its customers. Use exclusively with Dew.